Mighty Boosh star Matt Berry delves into a mixed bag of folk, prog and oddball pop yet insists he’s completely serious about his forays into musical absurdity, Getintothis’ Jamie Bowman isn’t quite so sure. 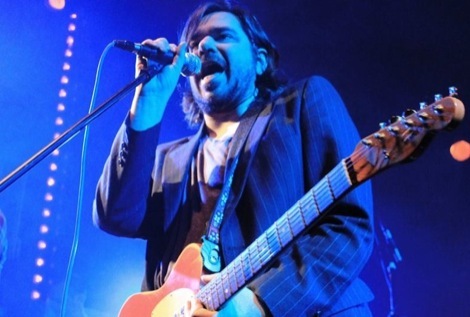 When Getintothis rather tipsily asked Matt Berry if he was entirely serious about his musical career, he gave me the sort of look he frequently aims at the IT Crowd‘s Roy when playing the baritone voiced Douglas Reynholm. Despite Berry’s claims, one look at the cover of his 2011 long player Witchazel confirms that the star of the Mighty Boosh and Garth Merenghi’s Dark Place has to have at least the tip of his tongue planted firmly in his cheek. A cloaked and bearded Berry standing in a thicket with a pheasant on his gloved hand hints at the 39-year-old’s obsession with all things folky but new album Kill The Wolf is more Wicker Man than Mumford and Sons and far from being some kind of Trevor and Simon ‘swing your pants’ wheeze is actually a collection of seriously tuneful songs. 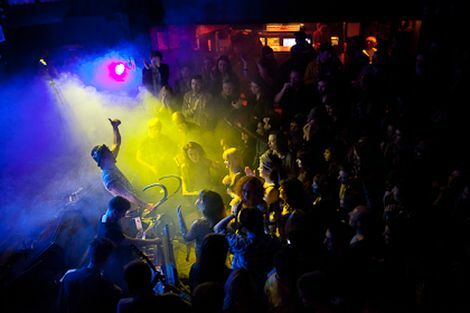 Live, Berry is a genial host, demanding a beer and speaking warmly of his love for Liverpool as his excellent backing band which features former Bluetones frontman Mark Morris, reproduce the warm and suprisngly funky textures of his back catalogue. It was put there by your mum‘) makes it sound like a Victorian child’s nursery rhyme. Take Me Hand, meanwhile, is a gorgeous slice of sunshine pop reminiscent of The Turtles or The Free Design. Musically the band swerve from the kind of funk-folk the likes of Traffic and Jethro Tull occasionally peddled to the full on gonzo prog psych of Hawkwind on eight minute opus The Pheasant. Best of all is Berry’s touching and heartfelt tribute to the compositional genius of TV soundtrack writer Ronnie Hazelhust which features a cod-reggae version of the theme tune to Sorry and a brilliant run through of Are You Being Served? Picture courtesy of Music Mafia.